For HCISD’s general naming guidelines and nomination forms, visit www.hcisd.org/nga or come by the district’s administration office at 407 N. 77 Sunshine Strip. Only names submitted by using the district nomination form will be considered. Deadline is Nov. 30. 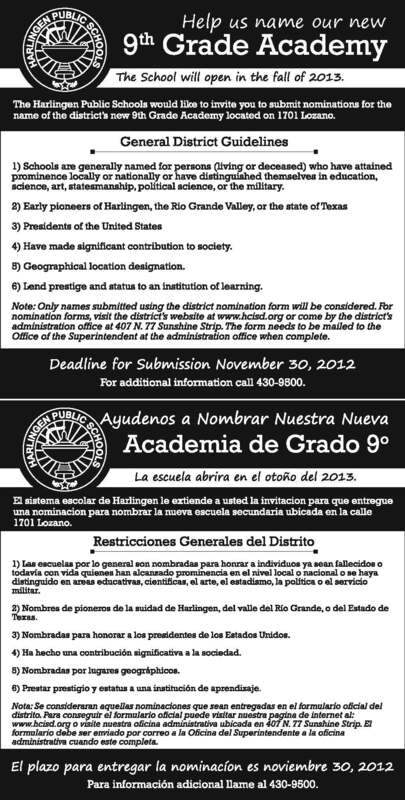 The Harlingen Consolidated Independent School District invites the community to submit nominations for the name of the district’s new 9th Grade Academy opening Fall 2013. The campus is located on 1701 Lozano. The deadline for submission is Nov. 30. Name it after the person who founded harlingen. Name it Harlingen High School Central – as it will become a high school eventually. All this time and energy coming up with a special name is a bit ridiculous. Not to mention the COST of having to change the name and signs and stationary. Please do us a favor just give it its permanent name already. I am writing you this as I am wearing my Alamo High School T-shirt. wait opr the BULL DOGS!!!! It should be called after the founder of harlingen which was “Lon Hill” and the mascot should be a king or another bird like a dove. we should name the new academy “United Academy School” the schools name should represent not only the students but the teacheers and staff. We are united as one and our name should show it, that is why i think it should be named “U.A.S.”. Thank you for considering my suggestion. the ravens should be our mascot and it should be named after lon c. hill cause she founded harlingen. ravens for mascot and named after lon c. hill. The mascot for the school should be a Panda. :D Just saying because everyone loves Pandas.